Windows 8 is here. . . Yes, you can download Windows 8 and use it on your computer, Microsoft released Windows 8 Consumer Preview , available free to download. It is available as 64-Bit and 32-Bit variant as ISO file type. It is available in many language , the size of its English variant , for 64 bit is of size 3.3 GB and 32 bit is of size 2.5 GB. Download 32 Bit version from here and 64 Bit version from here, just download, burn it on dvd and install it. 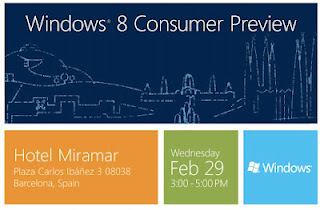 Please share your experience here about Windows 8. A Fact : "More than 1 million copies of Windows 8 downloaded within 24 hours of its launch."